A blog written by current students about life and study at the University of Kent. As it gets closer to the end of term I’m sure most of us are going to breathe a sigh of relief that our assignments are done and we won’t have to do our own laundry for a month. Before heading off home it might be worth celebrating surviving first term with your flatmates and friends. Some of your friends and flatmates might not be able to go home over Christmas, so having a pre-Christmas celebration meal would be appreciated, or perhaps you’ll be saying goodbye to some short-term exchange students. 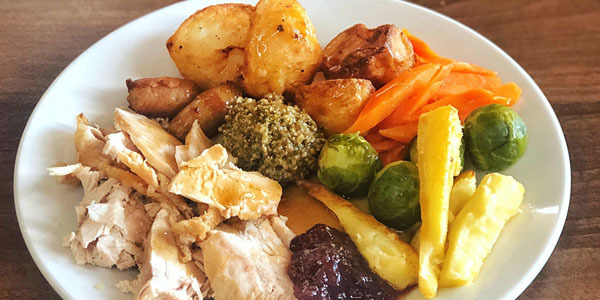 Either way, your first student Christmas meal is a brilliant way to end your first term at university! It should be easy now you’re a fully-fledged adult, however, cooking an entire chicken/turkey/nut roast for all your friends isn’t quite the same as making pasta. So, do some Google-ing into how to make a roast and list everything you’ll need. Although, you probably don’t need everything the top chefs use, so if it’s not essential leave it out or make do with a cost-effective alternative. It’s important to check what everyone wants, it might take a bit of negotiation, but you want to make sure everyone is catered for. The perfect Christmas meal doesn’t need to be pricey but you will need to agree a budget with your friends. You can do a pot-luck style and have everyone bring something (although you’ll need to organise who brings what in case you end up with five bags of potatoes) or agree a budget that you all contribute to and buy all your supplies in one go. Plus, if you’ve agreed to include drinks in the budget make sure you agree on what these will be and have a non-alcoholic alternative. Decide who is going to host the meal, and make sure all their housemates are invited! It’s also a good idea to figure out who is going to do what – you don’t want one person to be responsible for the whole meal! It can be hard to resist buying presents for everyone, but as you’re all living on a student budget a Secret Santa with a strict price limit can result in some brilliant (and hilarious) gifts. Plus, there’s no reason you can’t get a multipack of cards and write nice messages for everyone to show them how great they’ve made your first term. Tip Six: Don’t forget the tinsel! Making sure your kitchen is clean for your guests is a must, but it’s also time to deck the halls with boughs of holly! Grab your housemates for a shopping trip to town to get some Christmassy accessories for your flat. Alternatively, decorated with your favourite photos from the year so far. If you can’t convince one of your housemates to dress up like Santa why not see if you can find some board games in a charity shop, or play games which don’t require too much equipment such as Charades, Who Am I, or try making up your own!